Yet another travel.. er! Exam season begins! Our university conducts Supplementary examinations usually during December of each year - the exams got a little delayed this year, and happened in January. I had my share of exam work this year too. The exams were notified quite late - with one exam getting scheduled just 2 days before the exam! The one at Raichur was confirmed on a Friday, and the exam was on Sunday. I had to scramble for a ticket - getting one to reach Raichur wasn't difficult, but the return certainly was. I'll write about the return ticket hunt later. 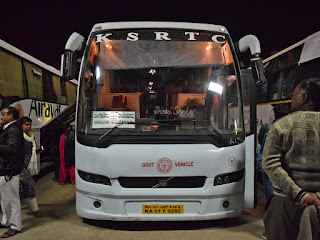 My choices for the outbound was simple - either the KSRTC Airavat Club Class or an AC sleeper by a private operator - an economical decision was taken here, and I picked the KSRTC option! I had a holiday at office, but had a lot of personal work outside, and ended up returning home well past my usual time of return from office. TW wasn't at home - I was left with a lot of minor works at home before I started off. My bus was scheduled to leave from Kempegowda Bus Station (Majestic) at 2152hrs - given by earlier experience of almost missing the bus (read here), I had decided not to take any chances, and had drawn plans to leave home by 2000hrs - 2030hrs in the worst case.I succeeded in leaving home at time, managed to get a BMTC bus to the metro station in no time, and got a train towards Majestic (Nadaprabhu Kempegowda Station) sooner. While on the train, I received an SMS from KSRTC with the details of the bus, and it was a Volvo this time as well (Yay!). I got to Majestic a little past 2100hrs - I saw my bus sneaking into the bus station as I walked out for my dinner. Had a quick dinner at Kamat restaurant outside the bus station - Kamat Hotel (Bengre Kamat's) is a sleepy place outside the bus station - it looks like a run down restaurant, with very aged interiors and worn furniture, but I among my favorite places in the region. The food is simple, is served quickly - and is delicious. I finished my dinner quickly and returned to the bus station. My bus, KA-01-F-9292, was already parked at the departure bay and boarding had already commenced. I got my ticket verified and attendance marked, and stayed out of the bus till the AC was turned on. It was actually colder outside, but it gets stuffy inside the bus if the AC isn't running. We seemed to have good loads on that day - the crew were busy following up passengers who hadn't reported. The bus station was getting crowded as it got later in the night. We finished all our pick-ups and slowly backed out of the platform by 2158hrs - about 6 minutes behind schedule. We quickly took the flyover, turned towards Race Course, then to Shivanand Circle, took Kumarakrupa road, and finally joined the Airport road at Windsor yield. We stopped at CBI bus stop, picked up more passengers (the last set) and got moving (2228hrs). The driver picked pace soon after we passed Hebbal. I was a little sleepy, and dozed off soon later. I woke up only as the bus pulled in for a break - as usual, the crew turned off the air conditioners (and the engine), and walked away. We were at Hotel Swagath Delicacy after Chikkaballapura (2335hrs). I strolled outside the hotel for some time. In the meantime, a couple of buses heading to Mantralayam (as specials) also joined us, along with plenty of Hyderabad bound buses! We started after dinner break 2358hrs. I slept even before the bus left the state of Karnataka - a nice long sleep actually. I woke up only when the lights were turned on as the crew called out for passengers alighting at Mantralayam (0514hrs). The bus almost emptied out here, and we got moving again by 0522hrs. I didn't want to sleep after Mantralayam, since my host in Raichur had informed that I had to get off before the bus station. Although I had informed the conductor, he sounded unsure of the location, and I didn't want to miss my stop. I remained hooked to GMaps to be sure. I moved towards the cabin as we neared my stop - as I got to the cabin, the driver (now sitting on the co-drivers' seat) reassured and requested that I remained seated. The conductor, who was now driving the bus, was told by the driver where to stop the bus - I was dropped at my location at 0606hrs - about 4.5kms before the final destination of the service. The bus was late, but the delay was acceptable. Summary: The bus, KA-01-F-9292, homed at Bengaluru-4 depot had clocked about 13 Lakh kilometres. The bus was not in the usual KSRTC state - this one creaked, had an annoying noise from the rear suspension. The drivers did a good job - their behaviour to passengers was very friendly and truly deserves appreciation. The driving style was stable - they didn't lug, but didn't go very fast either. The departure and arrival was delayed - but acceptable at both ends. The run time was good as well. Overall, another good experience with KSRTC. Will I take this service again? I am a fan already! Sure to take them again. The year I'd love forever: 2018!